What You Will Need: Apples Peanut butter or almond butter Nuts (I use almonds and pecans) Coconut flakes Chocolate chips What You a Will Do: 1. Core your apple, then slice the apples into discs about a quarter or half inch thick. 2. Spread the nut butter on the apple disk. 3. Add nuts, coconut flakes, and chocolate chips. 4. Enjoy!! 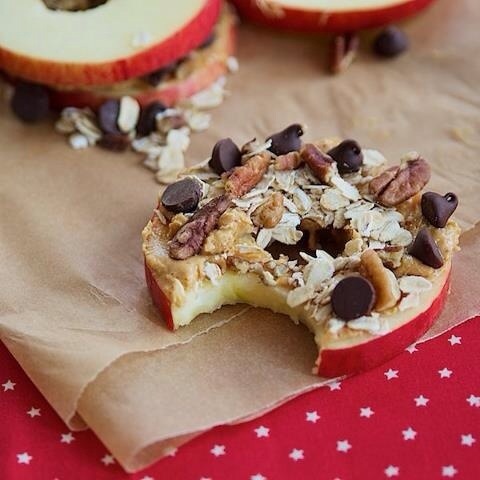 This entry was posted in Health and tagged after school snacks, apples, crisp apple snacks, Health, healthy snacks, Snacks on November 22, 2014 by Lacy. After school snacks are important for your little man. After a long hard day at school he needs an energy pick me up, and as Moms we do not want to feed him something that will just give him a crazy sugar high and lead to a crash later. Not only is it bad for him, it disrupts our day as well! We also do not want to infringe upon that dinner that will soon be approaching. So what do we do? How about a healthy and complete protein that will not only keep your little man’s blood sugar level it will also fill him up until dinner time without over-filling him so that he won’t eat that dinner you have been planning. So how do we complete this amazing feat? Simple, think PBJ meets banana, meets hotdog. Sound crazy? Sound disgusting? Hey don’t knock it till you try it! This great little treat is not only fun to make and look at, it is delicious. Trust us, we wouldn’t steer you wrong. After all at The Boy’s Store we are here to help you out! So at least try it before you call us crazy. 1. 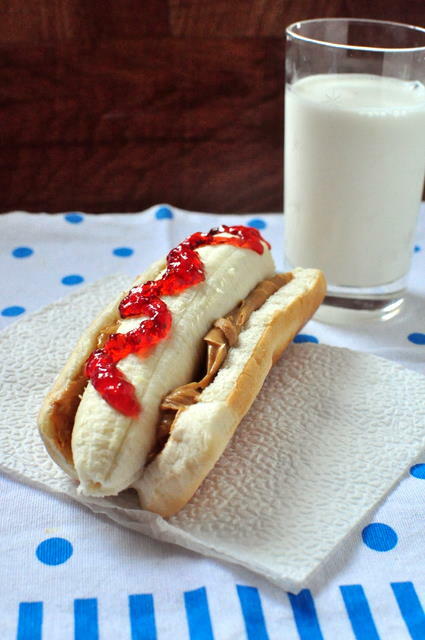 Open the Hot Dog Bun and spread it with some delicious peanut butter. 2. Place the whole banana in the hot dog bun. 3. Use Jelly to create a “ketchup” effect. 4. Pair it with a cool glass of Milk and serve it up cold! Your little man will love the fun twist on a hotdog, and you will love the simplicity of the afternoon snack. Who knows, it may just become a go to snack. Enjoy! This entry was posted in Activities, Health and tagged Activities, after school snacks, banana dog, food, Health, hotdog, recipes, Snacks, the boys store on February 26, 2012 by Lacy.